If you’re in a foreign country and try to read a map, you may find it difficult — unless your host nation’s language is the same as your home nation’s, the words are going to be different and, assuming you’re not bilingual, will require some translation. But the locations of the roads, rivers, buildings, and the like should be the same, regardless of whether the map is in English, Spanish, or Chinese, right? Language aside, Google Maps should work the same everywhere, right? Pictured above is a map of the China/Hong Kong border via Google Maps; you can see it yourself by clicking here. The map is your standard road map overlaid upon a satellite image. As you can see, the roads — the light grey lines — don’t match up with reality. There are roundabouts which purport to be in public parks, bridges which don’t exist, and multi-lane highways which seem to be underwater. The whole thing is a big navigational mess. Go far enough into Hong Kong, though, and the problem abates. What’s going on? The map data, basically, is being lost in translation. The world — China aside — uses something called the World Geodetic System 1984 (“WGS-84”) as the basis for the digital maps. Virtually all the navigation tools we use online today — the maps apps on our phones, the GPS systems in our cars, the missile guidance systems in use by the military, and yes, Google Maps — all use WGS-84. China, though, goes its own way. The Chinese use something called GCJ-02, an alternative system which the cartography world colloquially refers to it as the “Mars Coordinates” as it may as well be made for another planet. 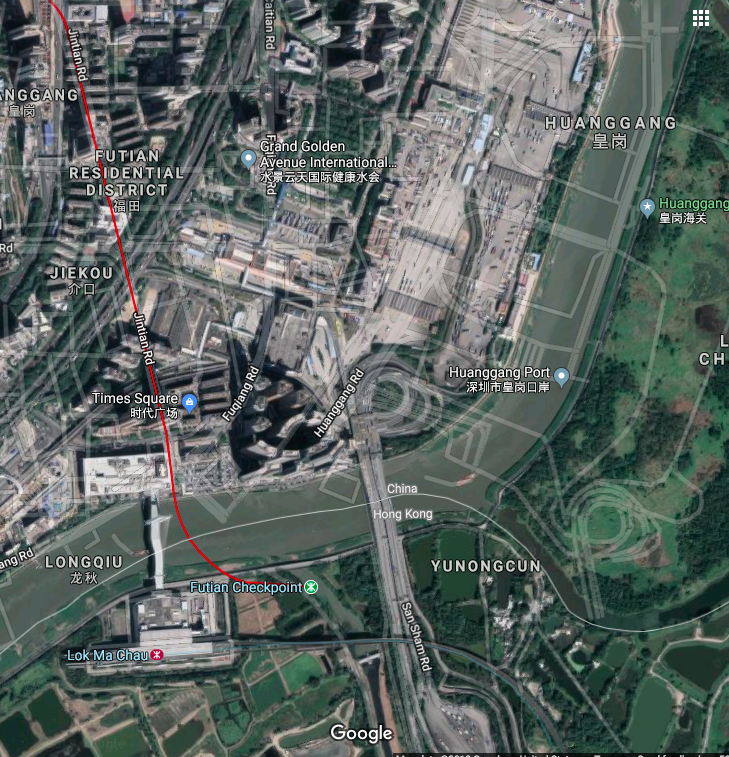 The Google Maps screenshot and link, above, shows the problem: the road map data comes from the Chinese government, which uses GCJ-02, but the satellite data is from a non-Chinese source and uses WGS-84. (As China exerts control over, and takes responsibility for mapping out the border between itself and Hong Kong, the problem bleeds into the neighboring pseudo-sovereign state.) The two data sets, effectively, are speaking different languages. So if you’re traveling to China, knowing Chinese may be a lot more helpful than you’d think. From the Archives: Reverse Cartography: Agloe didn’t exist until someone put it on the map. Then, it did.